The start of the 12th fighting season for U.S. forces in Afghanistan has meant continued transition for Marines in Helmand province — including mostly standing by as the Taliban launches attacks in the region. A large number of Taliban insurgents, along with foreign fighters, tried to overrun Sangin district this week, prompting a two-day engagement with Afghan National Security Forces, military officials said. The fight was outlined by a Wall Street Journal reporter in Afghanistan this week, launching it into the limelight. In past years — even last year — Marines would have been in the middle of the fracas. That’s not the case anymore, however, said officials with Regional Command Southwest, the region overseen by Marine forces. That’s a far cry even from a year ago, when Marines conducted partnered operations through the summer, until swapping over to a security force assistance model that pushed Afghans into the lead. Marines faced tough fights even then, as I pointed out in this story last spring while embedded in Sangin. Marines have continued to close bases across Helmand as the drawdown progresses, as well. That includes sizable outposts like Forward Operating Base Payne, which 3rd Battalion, 9th Marines, out of Camp Lejeune, N.C., began demilitarizing in April. That effort was later taken over by 2nd Battalion, 8th Marines, which replaced 3/9 in theater this spring as part of regularly scheduled troop rotations. 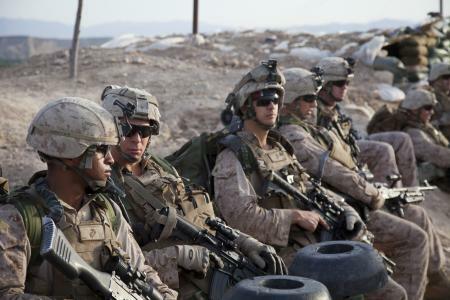 While 2/8 is now the main maneuver unit in central and southern Helmand, 3rd Battalion, 4th Marine, out of Twentynine Palms, Calif., has taken over for 2nd Battalion, 7th Marines, in the northern part of the province. That places them in an advise-and-assist mission in Sangin, Kajaki, Musa Qala and several other areas that have remained more hostile. Col. Thomas Collins, a spokesman with the International Security Assistance Force overseeing coalition forces, downplayed the attacks in Helmand. This will bear more watching in coming months — especially considering the sacrifices so many U.S. troops already have made.